They do exist! The subject of folklore and tabloid headlines for decades, Cryptkins have been discovered and the world will never be the same! These adorable vinyl figures are approximately 2 1/4-inches tall and include Nessie, Chupacabra, Cthulhu, Bigfoot and more. There are 13 figures in all, with 2 of them being rare and 1 being ultra-rare. Each Cryptkin comes packaged in a collectible blind-reveal miniature crate. 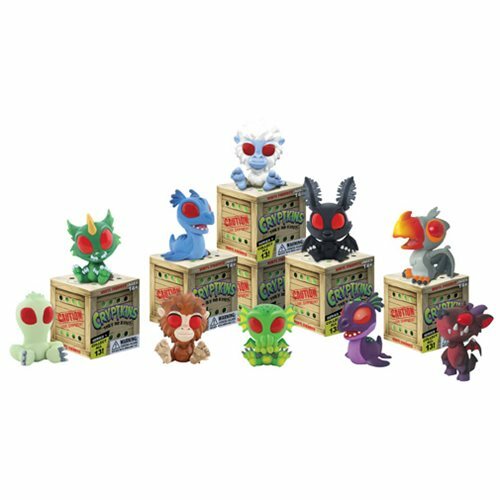 The Cryptkins Mini-Figure Display Box contains 12 individually blind-packaged mini-figures.